Another pretty room – Pinterest is full of those isn’t it?? This room belongs to Stacy of South Shore Decorating – previously named as Conspicuous Style. I’ve followed her for a long time, and really admire her style, and her story. Her bedroom is one of my all time favorite spaces – all cool soothing tones of icy blues, greens and greys. All the white in the bedding and bed frame allow the wall color to shine, and it actually gives the room a silvery feel. Everything about this room says elegance, sophistication, and “no chocolate on your hands please” (a personal mantra of mine)! It’s absolutely, drop dead gorgeous. And the zebra?? Everyone I know thinks I’ve become a bit nutty with this animal print obsession, but I LOVE it! 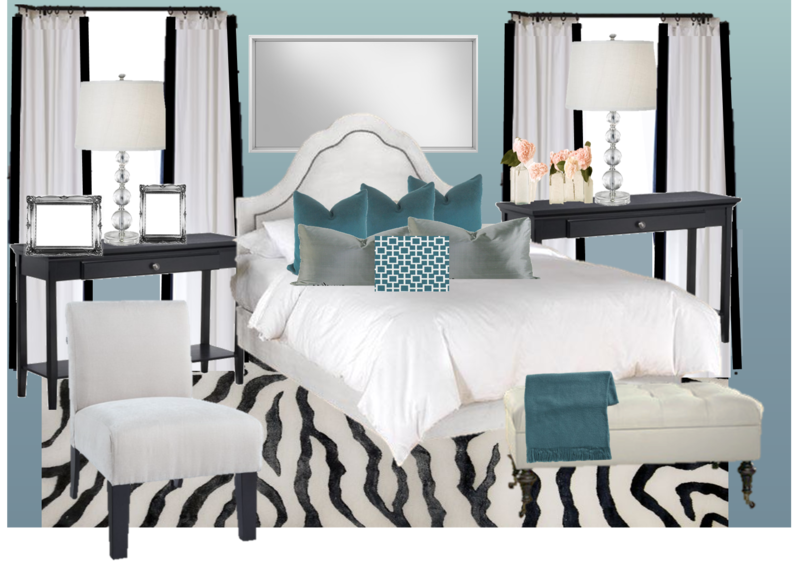 Well, imitation is the sincerest form of flattery, and being a gal on a budget, I created a design board that mimics this room, but won’t break the bank. If you love it, check out the “where to buy” guide below – and if you are interested in having my help creating a design board for a room you are working on – send me a private message! I’m more than happy to help! 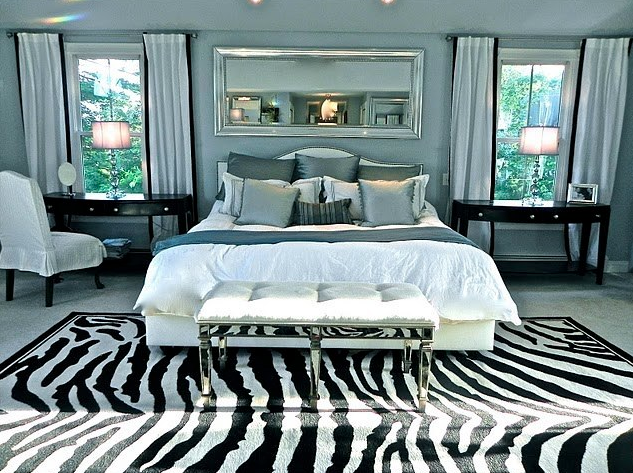 In case her fabulous bedroom didn’t impress you enough on it’s own – she is INCREDIBLY down to earth! Amen sister – anyone who A) can put that room together, B) loves Target (pronounced Tar-shay) as much as I do, and C) still looks to cut corners without sacrificing style is definitely WORTHY of the title “Design Icon” – and she is certainly one for me! Read the rest of the interview here, and go check out her blog, plus more pictures of her lovely home here! This entry was posted in Home Decor, inspiration board, interior design by Simply Styled. Bookmark the permalink. I just saw this tonight Becky- thank you so much for the kind words!